Last updated by Mark Jala at March 30 . My Best Stainless Steel Cookware Review covers best quality, best value and best budget stainless steel cookware. A stainless steel cookware set is popular because it is healthy, attractive, easy to clean and reasonably priced. While there are a lot of manufacturers for stainless steel cookware, finding the best in various categories relies on usage, appearance, features and user reviews. You can’t go wrong with any of the items in my best stainless steel cookware reviews. There are 4 key criteria I look for when making my selections. 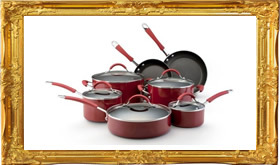 All-Clad is a top American made cookware manufacturer specializing in the bonding of metals. Stainless steel cookware is one of their specialties. 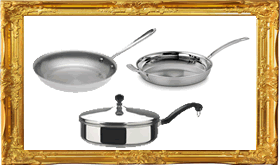 All-Clad stainless steel cookware will be the heaviest of the 3 choices because of their restaurant quality design. It is professional grade cookware. While this design has been around for a very long time and the new d5 series does indeed have even more advanced features, the regular All-Clad stainless steel cookware is now offered at value pricing, for All-Clad. Click here for a full cookware review on All-Clad Stainless Steel Cookware. Cuisinart MultiClad Pro cookware is my best value selection for stainless steel cookware. It is near All-Clad quality at about 1/2 the street price. I use the Cuisinart MultiClad Pro cookware all the time and absolutely love it. It cleans up well, especially if you have a little Bar Keeper’s Friend handy. It is sturdy and I really like the pour lip on the top edge. Cuisinart cookware is well made and can handle anything a home cook can put it through. Click here for the full cookware review on Cuisinart MultiClad Pro. Farberware Classic stainless steel cookware has been around for ages and is just as good as always. With new advanced features like pour spouts and better pour lips, Farberware classic is cookware that can truly last a lifetime. In the budget priced category, it is surprisingly durable and well made. The key difference between the Farberware Classic and the All-Clad and Cuisinart offerings, the Farberware is clad only on the bottom of the cookware. For any cook who knows the value of fully clad cookware, they know it makes a huge difference in cooking. For a starter cookware set or someone on a budget, the Farberware Classic is truly a steal. Click here for the full cookware review on Farberware Classic Stainless Steel. Roasting pans and roasting racks are usually pulled out for the holidays. Unfortunately we often put them away after the holidays are gone. Roasting pans are great all year long for a variety of foods, whether it’s lasagna, casseroles, or chicken. This roasting pans review covers both stainless steel roasting pans and nonstick roasting pans. I looked at a lot of pans and awarded 2 as “The Best Roasting Pans with Roasting Racks.” Many magazines and other cooking authorities liked a particular model, but I found problems with it. I’ll tell you my picks and what I didn’t like with a popular media favorite. A good one will be thick enough so as not to warp. The key here is not as much warping when roasting, but warping when you are deglazing the pan on the stove top. All those juices that drip into the pan make a great starter for a sauce. Once the roast or chicken is removed, any veggies removed and the rack removed, then it’s time to put it on the stove top and deglaze the pan. This will often use a direct heat that is higher than what it sees inside the oven. Some roasting pans don’t have a flat bottom. Some chefs prefer a ridge to separate foods. I prefer a flat bottom. The ability for a roasting pan to handle good heat inside the oven and on top of the stove is essential. The next feature I look for is adequate size. While the larger sizes may not fit ovens in smaller apartments or homes, they serve a great purpose being large. The larger size accommodates larger foods and handle huge casseroles. Handles that flare outwards rather than straight up or inward. I’ve used pans that are straight up or inward and I burn myself more often on those than the ones that flare outward. Also, if the handles don’t flare out, you will mess up your mitts on the surface of the roast. Please note this makes the overall dimensions even larger. Lastly, I look at heating abilities. When roasting, most of the heat comes from the top. There is still a good amount of heat coming from the bottom, especially if the pan is not full of veggies. When using a roasting pan for casseroles, the heating qualities are critical. Multi-ply and sturdy pans heat better without the hotspots. My award for the best stainless steel roasting pan with rack goes to the Cuisinart Multiclad Pro with Stainless Steel Rack. (Amazon incorrectly advertises it as having a nonstick rack. It’s stainless steel.) I have other Cuisinart Multiclad Pro cookware and absolutely love them. They clean up easily, they are dishwasher safe, and heat exceptionally evenly. The triple ply construction assures even heating and durability on top of the stove and in the oven. It is induction ready also. With a street price around $75.00, it’s a real bargain. I have a love hate relationship with nonstick roasting pans. While I like how they clean up, I hate having a traditional nonstick surface around my food. I’m not a health nut, but I take precautions every place I can. The Emeril hard anodized nonstick roasting pan and rack, made by All-Clad, is the exception to the rule. It is a very sturdy pan, scratch resistant, and PFOA free. Nonstick surfaces are going to have the PTFE’s, but at least this one doesn’t have the PFOA’s. I love how sturdy this pan is and the anodized aluminum heats very evenly. February 2014 Update: At this time it is difficult to find the Emeril roasting rack. I will be looking for a new nonstick rack to recommend. There is a Calphalon stainless steel roasting pan many in the industry love and give it high marks. I have it and use it. I didn’t award it because it has a raised bottom in the middle of the pan and it has handles that flare inwards. I’ve burned myself too many times to award it. I can see the advantage of it flaring inside as it allows better balance of heavy items, but I still prefer the handles flaring outward. Finally, I urge you to use your roasting pan beyond the holidays. Use it for any large items and for casseroles. This article was updated February 2014.